Senior Administration officials increasing pressure by naming those who've been sanctioned. Includes PM of Crimea, "crony of Russian govt." While we will not rule out taking additional steps in the future, right now the administration is trying to identify the 'cronies' of the Russian government, one senior administration official said on the call. The sanctions are meant to target the personal wealth of 'cronies' rather than their businesses. US sanctions also hit: · Dmitry Rogozin, Deputy Prime Minister of the Russian Federation. The executive order lists seven government officials subject to sanctions. Under the new executive order, their assets under U.S. jurisdiction are frozen. Senior administration officials are holding a call with reporters to discuss the executive order announced Monday. The executive order 'expands the scope of our sanctions' and the administration is doing so to impose costs on Russia for its actions in Crimea, according to one of the officials on the call. Opposition leader Yulia Tymoshenko has released a statement lambasting the Crimean referendum, saying it was no referendum at all. first and foremost. 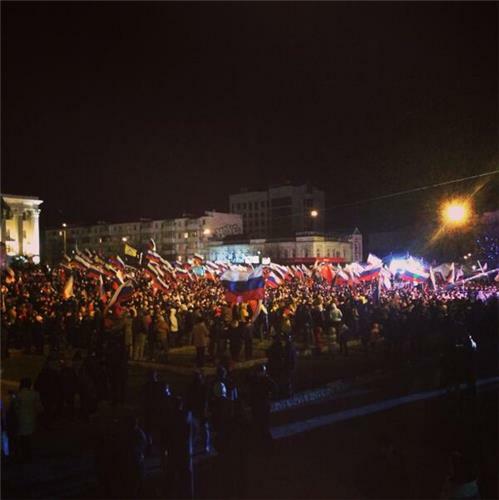 March 16 in the Crimean autonomy was no "referendum". Under the "referendum" disguised blatant military aggression against Ukraine and attempt to annex part of Ukrainian territory. Results of the referendum is not recognized and not recognized by any civilized country. It is entirely illegal, but its legal consequences quite negligible.This adventure will not get a long historical continuation. second. 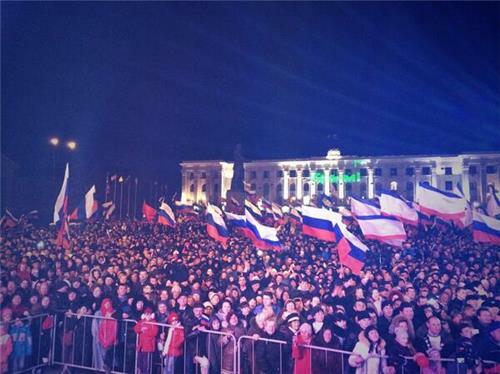 Crimea is, is and will always Ukrainian, despite all attempts to Russian occupation. This is our land and we will not give it to anyone! Third. all my heart I want to thank all those people who protect and defend the national interests of Ukraine in Crimea in those dramatic days. Thank war Ukraine, showed fortitude, incredible examples of courage and patriotism. 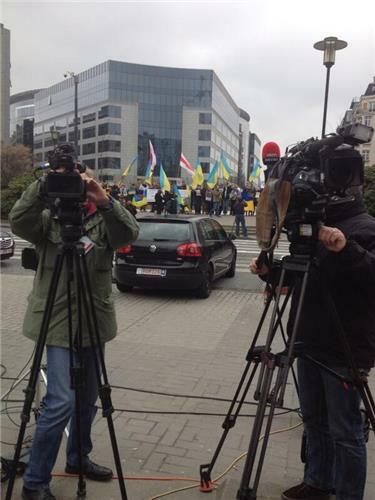 Thank Crimeans who did not support the separatists, the Crimean Tatars, volunteers and journalists. Thanks to you, today comes a new, proud and beautiful Ukraine, the country - the hero! And with this fact Russian aggressors have nothing to do. And justice will soon be restored. I insist that the Ukrainian parliament immediately ratified the Rome Statute and the Ukraine has the right to appeal to the International Criminal Court in The Hague, and appealed to the Constitutional Court of Ukraine on the compatibility of the Rome Statute and the Constitution. Ukraine should immediately contact the International Criminal Court to halt military occupation of Ukraine. All those involved in military aggression against our country should be personally international responsibility. 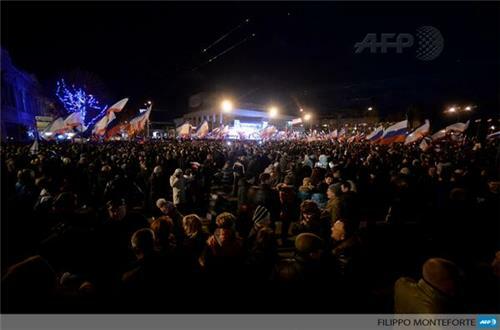 Crimeans I sympathize with those who were led to this adventure and become victims of their own frivolity and naivete. They can be caught in the darkness of his sunny island. 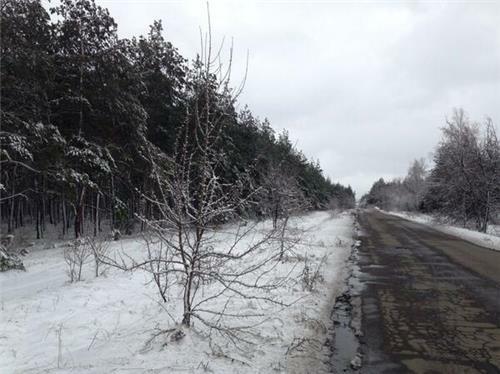 Russian regime is easy for them to prove that the polar night there and in the subtropics. All this may lead to a humanitarian catastrophe and unpredictable consequences for the Crimeans. No economic paradise will not. Russia has no resources for that, its economy is on the verge of collapse. And given the fact that the leading countries of the world now introduced sanctions against Russia superrigid, tomorrow they will not be up to the Crimea and Crimean. Fourth. I feel sorry for the citizens of Russia. Today they are a totalitarian abyss that would entail not only economic but also spiritual decline. Using dirty and immoral means destroying the truth as a concept in a frantic propaganda to capture Ukraine, the Russian government has eliminated the myth of Orthodoxy, spirituality and sacredness of Russia, about its alleged special role in the positive history of mankind. Instead, the whole world saw immoral and unmotivated aggressive Russia, questioned the peaceful coexistence of peoples of the world. Russian regime leveled even the historical role of Russia in the Second World War. Liberator of it turned her into an invader. This moral loss for Russia is much more tragic than the material losses as a result of international sanctions. But the hope is that today is born and a new Russia. It's not Putin's Russia, and the country that over the weekend started a peace march.This Russian Andrei Makarevich with yellow-blue ribbon, Russia Leah Akhedzhakova, Eldar Ryazanov, Boris Grebenshikov. With such a Russia, Ukraine has a real future. fifth. At Maidan Ukraine's European choice and made ​​its first victory in the fight for European values, removing the dictatorship. Now, despite all the difficulties, we are united as never before. March 21 we are waiting for an association agreement with the EU. It is Ukraine's success and should not erase. Let no one doubt our stability and confidence.We made ​​our choice. We choose freedom! And one more ... Ukrainian Maidan dropped criminal despotism. People won. This is good, but have no right to stay. 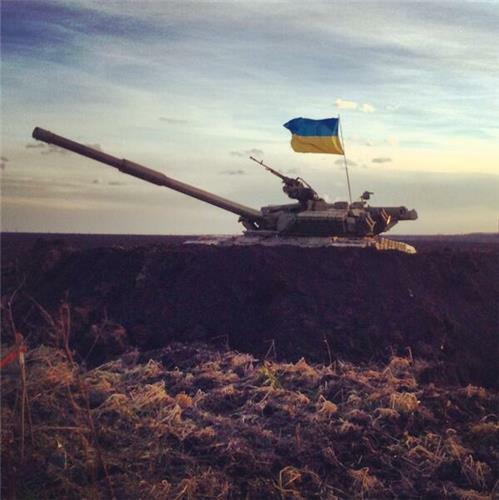 Because today is tyranny seeks to conquer neighboring Ukraine. We are peaceful people and do not want to fight. But when it is necessary, we are able not only to defend himself. Perhaps even against our will, in Ukraine, a new and great mission: spiritual and moral force to help break the tyranny of the neighboring country! Ukraine has learned to win and today has a powerful weapon in the world - will power, honor, truth and spirit! Today in Ukraine only geographical but also the spiritual center of Europe. World obviously noticed this and became close with Ukraine. Last Saturday Novodvorskaya said that a democratic Russia is waiting for Ukrainian army-liberator. Of course, it is - a metaphor. But there is a grain of reality. We did not go to anyone to visit with tanks and machine guns. But we have another army. And the army, which will not keep no boundaries, trenches, antitank "hedgehogs" and minefields. This is our Ukrainian army of freedom, democracy, human dignity and spirit. And it is already on the march! Ukraine will fulfill its mission, including the liberation of Russia. Everything will be fine! Below is the full statement from the Russian Foreign Ministry on support groups for Ukraine. The statement calls for respect and recognition of the Crimean referendum and gives Russian language official designation. Recently, our Western partners are actively calling for the creation of the Contact Group on the settlement of the situation in Ukraine, but based on the fact that such a structure should be engaged in the dialogue between Moscow and Kiev. As has been explained by the Russian side, the current situation in Ukraine is not created by us, and is the result of a profound crisis of the Ukrainian state, which led to the polarization of society and the sharp aggravation of antagonism between different parts of the country. It is on to help overcome these contradictions should be directed efforts of the international community. Following this task, taking into account appeals to us from the U.S. and European countries, we are prepared and handed over a week ago, our main partners in the U.S., Europe and other regions of the Russian proposals on how it might be organized outside assistance to the steps to be taken Ukrainians themselves out of the crisis. To this end, we have proposed to form a compact group support for Ukraine in the composition acceptable to all Ukrainian political forces. - Recognize the importance of civil peace and national accord in Ukraine to promote constructive relations in the Euro-Atlantic region on the basis of equality and mutual respect of interests of all local states. The objectives of the Support Group would encourage Ukrainians to the implementation of the following priority actions. 1. Immediately implement the obligations contained in the Agreement on the settlement of the situation in Ukraine on February 21, 2014, to confiscate illegal weapons, the release of illegally occupied buildings, streets and squares, as well as on the organization of an objective investigation into the violence in December 2013 - February 2014 . - Will be prohibited and punishable interfere in the affairs of the church and interfaith relations. Decision on approval of a new constitution was adopted by the constitutional assembly on the basis of the consent of all participants. The draft constitution was put to a referendum. 3. Immediately after the approval of the new constitution should be assigned to conduct an objective with broad and international observation of national elections, the highest state authorities of Ukraine with the simultaneous election of the legislative and executive authorities in each subject of the federation. 4. Recognizes and respects the right to determine its own destiny Crimea in accordance with the results of the free will of its population in the course of the 16 March 2014 referendum. 5. Mounted on the basis of the aggregate of the above objectives and principles state system of Ukraine, its sovereignty, territorial integrity and neutral military-political status guaranteed Russia, the European Union and the United States with binding UN Security Council resolution. Russia is ready to work with our partners without delay to the formation of a multilateral mechanism to facilitate the settlement of the Ukrainian crisis in accordance with the proposals. 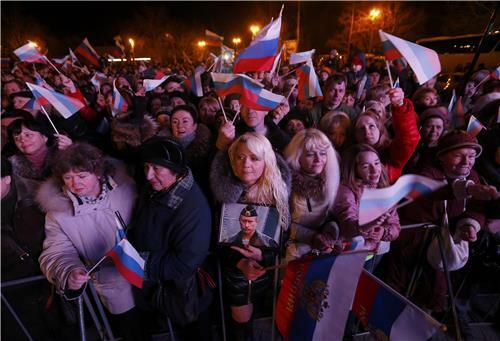 #Ukraine opposition leader Vitaly Klitschko says ethnic cleansing on agenda in Crimea. According to Russian news agencies, Crimea has said it nationalizes energy companies Chornomornaftohaz and Ukrtransgaz, Reuters reports. 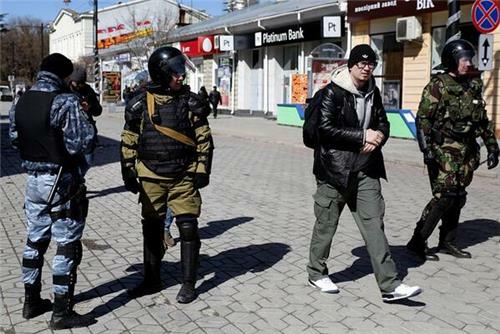 Perhaps Maidan protestors and pro-Russian Crimeans have more in common than they know. Both tired of bad government/corruption in #Ukraine . According to a statement from the foreign ministry, Russia says the United Nations' assessment of the human rights situation in Ukraine is 'biased,' Reuters reports. The Crimean parliament has been quite busy Monday. The body released a bevy of statements, including one stating that the region will officially switch to Moscow time on March 30. In another statement, the the parliament lays out a plan for future governance and drops the word Autonomous from Crimea's official name. What was once called the Autonomous Republic of Crimea is now referred to only as the Republic of Crimea. On 17 March 2014 the supreme authority of the Republic of Crimea is the parliament of the Republic of Crimea in the current composition of the deputy to serve until September 2015. For a decision - "On the succession of the Republic of Crimea" - at an extraordinary plenary meeting of the session of the Supreme Soviet of Crimea voted 85 deputies. Prior to the adoption of the new Constitution of the Republic of Crimea will act Constitution ARC 1998. In connection with the proclamation of the Republic of Crimea as an independent sovereign state, taking into account the will of the Ukrainian citizens residing in the territory of the Republic of Crimea, on the reunification of the Crimea with Russia on the Rights of the Russian Federation, as enshrined obschekrymskogo results of the referendum held on March 16, 2014, the Supreme Council of the Autonomous Republic of Crimea and ruled that the legal and other acts of the Autonomous Republic of Crimea and local authorities in the Autonomous Republic of Crimea, adopted prior to the proclamation of the Republic of Crimea as an independent sovereign state, are operating on the territory of the Republic of Crimea and sovetstvuyuschih regions to the extent not contrary to the interests of the Republic of Crimea. Executive authorities, courts, prosecutors, law enforcement and regulatory authorities, local authorities, acting on the territory of the Autonomous Republic of Crimea until the proclamation of the Republic of Crimea as an independent sovereign state, exercise their powers to the extent not contrary to the interests of the Republic of Crimea, before the adoption of the Constitution of the Republic of Crimea. The Republic of Crimea determined by the boundaries of the Autonomous Republic of Crimea and Sevastopol city that existed on the day of the proclamation of the Republic of Crimea as an independent sovereign state. In the Republic of Crimea is guaranteed to ensure human rights for everyone, irrespective of ethnicity and other characteristics. Chairman of the State Council of the Republic of Crimea Vladimir Konstantinov, commenting on the results of the extraordinary plenary session of the Parliament of the Republic, drew attention to the fact that an independent Crimean State guarantees freedom of choice for everyone caught in its territory. "Those who do not accept their beliefs Crimean independence and remains faithful to the Ukrainian state, would not be prosecuted. Thus, Ukrainian servicemen of the Armed Forces will be given an alternative: serve in the Crimea, bringing oath Republic, or continue it outside of Crimea - a member of the Ukrainian army. The same principle will be applied to civil servants, employees of law enforcement agencies, to all who took the oath of allegiance to Ukraine. Nobody force violently pereprisyagat will not "- said the speaker. Vladimir Konstantinov particularly noted that Crimeans voted in a referendum not against Ukraine and Ukrainians. "However, if seized power in Kiev regime would threaten the Republic, to try to blackmail her, Crimeans fail to stand up for themselves. It should also be remembered that for us - Russia, which in their trouble did not cast ", - he said. Head of the Crimean Parliament ensured that the republic will not allow the targeting of state symbols of Ukraine "will be created collection point symbols of the Ukrainian state, which then arrange for its disposal Crimean authorities delicately. 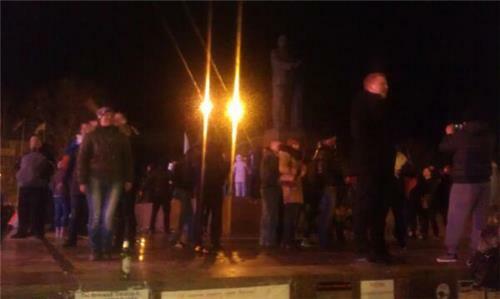 Crimea does not tolerate vandalism, which demonstrate his ideological enemies and haters. " Do not forget the Crimean authorities and the students from the Crimea enrolled in universities in Kiev and other Ukrainian cities. According to Vladimir Konstantinov, "in case of harassment or if they encounter difficulties in employment, in each such case the management of the Crimea will deal individually and anyone in trouble will not leave." Also speaker of the Crimean parliament has given assurances to owners of private property, that it will remain in their possession, it was acquired legally. Vladimir Konstantinov said that the authorities of the Republic will do everything they can to gaining independence Crimea and its entry into the Russian Federation does not infringe anybody's interests, passed the most comfortable for all Crimeans. "Crimea in the Russian Federation - not the enemy Ukraine", - concluded the Chairman of the State Council of the Republic of Crimea. German Chancellor Merkel's spokesman says Russia must put an end to any military activity in Ukraine that is not agreed to with Kiev, Reuters reports. Around 3:30 a.m. ET, The Associated Press, citing the Crimean election chief, reported that 97 percent of voters supported joining Russia in the final vote results. 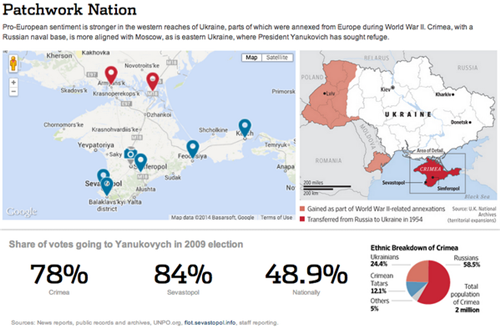 That wide margin led the region's parliament to officially declare Crimea an independent state. President Obama spoke this afternoon with President Putin of Russia. President Obama emphasized that the Crimean “referendum,” which violates the Ukrainian constitution and occurred under duress of Russian military intervention, would never be recognized by the United States and the international community. He emphasized that Russia’s actions were in violation of Ukraine’s sovereignty and territorial integrity and that, in coordination with our European partners, we are prepared to impose additional costs on Russia for its actions. President Obama underscored that there remains a clear path for resolving this crisis diplomatically, in a way that addresses the interests of both Russia and the people of Ukraine. He noted that the Ukrainian government continues to take concrete steps that would allow for the de-escalation of the crisis, particularly as it prepares for elections this Spring and undertakes constitutional reform, and he asked that Russia support the immediate deployment of international monitors to help prevent acts of violence by any groups. President Obama reiterated that a diplomatic resolution cannot be achieved while Russian military forces continue their incursions into Ukrainian territory and that the large-scale Russian military exercises on Ukraine’s borders only exacerbate the tension. President Obama said that Secretary Kerry continues to be prepared to work together with Foreign Minister Lavrov and the Ukrainian government to find a diplomatic resolution to the crisis. The White House says that President Obama told Russia's Putin that Sunday's referendum in Crimea "would never be recognized" by the United States or the international community, Reuters reports. Obama emphasized that Russia’s actions were in violation of Ukraine’s sovereignty and territorial integrity and that, in coordination with our European partners, we are prepared to impose "additional costs" on Russia for its actions. Russian President Putin says Ukrainian authorities show lack of willingness to curb violence against Russian speaks, speakers in Ukraine tell Reuters. Crimean Prime Minister Sergey Aksyonov says Crimean parliament to hold extraordinary session at 10 am tomorrow to approve referendum results, Russia's Itar-Tass news agency reports.